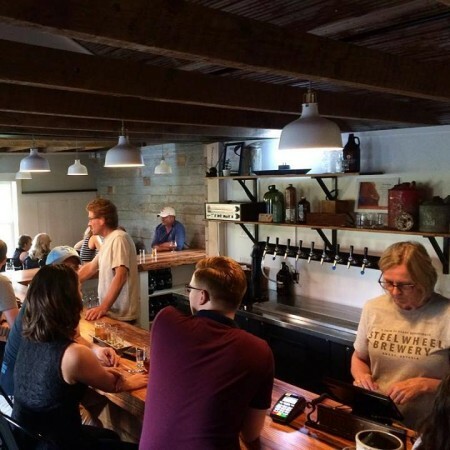 BRANT, ON – A new farm-based brewery in Brant, a municipality in southwestern Ontario, has announced that it is now open. Steel Wheel Brewery has been founded by Harold Kuret and Cindy Blair, and is situated in a circa-1890s farmhouse on the farm they have owned since 2005, with hops being grown there since 2015. The brewery had a soft opening last Friday before officially launching on Saturday. Beers available in bottles and on draught in the taproom and store include a Pale Ale (4.2% abv), East Coast IPA (6.3% abv), and Stout (5.1% abv). Two limited variants of the latter – flavoured with cold brew coffee and chai – were also on tap on the weekend. Steel Wheel Brewery is located at 105 Powerline Road in Brant, and is open from 12:00 noon to 9:00 PM on Friday and Saturday, and 12:00 to 5:00 PM on Sunday. For more details, see the Steel Wheel website and Facebook page.